The main competition for the Alpha 450 comes from its big brother, the Alpha 550. Both feature the same 14.2-million-pixel sensor, but the Alpha 550 has the better Live View system and LCD screen, as discussed in the main test. 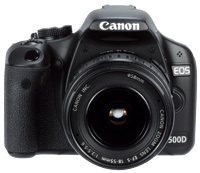 Apart from Sony’s own Alpha 550, the biggest competitor to the Alpha 450 is, in the short term at least, the Canon EOS 500D. It features a 15.1-million-pixel sensor and HD video capture, and has a current body-only street price of just £80 more than the Alpha 450. I would expect the price of the Alpha 450 to fall once it has been available for a while, but even then it will be hard for it to compete against the Canon models and potentially the next generation of Nikon DX cameras.